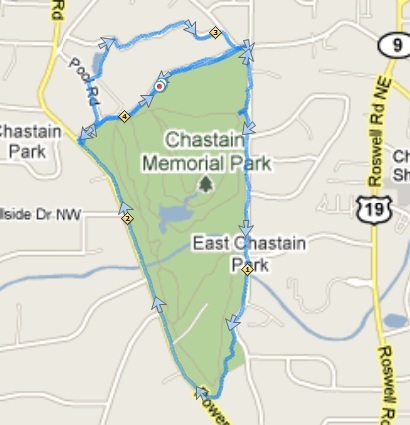 For the next post in my Atlanta running trail mapping project, I will cover Chastain Park. Chastain Park has a nice, mostly concrete running trail around the perimeter of the golf course. In places it is not clearly marked, leaving you wondering which way to go, but it is roughly 3 miles total. There are a few hills – one nice steep hill with cut-backs near the south end of the park – so I would say that it is a moderately easy run. If you’re looking for the beautiful people, this is where they all went. I have never seen so many people take a shower and put on makeup BEFORE their workout, but it sems to be the standard operating procedure here. Pick out your best running gear (and maybe a little perfume or cologne) if you want to fit in. There have been several celebrity sightings on this trail… It is well worth it for the people-watching alone! Know of a great Atlanta running location? Drop a note and I will add it to my list. Directions: From midtown Atlanta, go north on Peachtree into Buckhead; pass Lenox Square and Phipps Plaza then turn left on W. Wieuca. Continue on into the park or turn left on Lake Forrest Road.